Hoteleri Turizem Albania: Take Five: Whether your ideal trip includes the coast, the mountains, history or food, these five Albanian highlights have something for everyone. Take Five: Whether your ideal trip includes the coast, the mountains, history or food, these five Albanian highlights have something for everyone. Albania, located on the Balkan Peninsula in Southeastern Europe, is a little country with a lot to offer. Beaches stretch across its western Adriatic coast. A string of rugged mountains—perfect for hiking and climbing—are scattered across its landscape. There’s also the newly renovated culture heritage sites, fresh and locally grown cuisine, cosmopolitan cities and rustic villages. And all of this at just a fraction of what it costs to vacation in other European locales … a beer, for instance, costs about 250 Lek, or about two dollars. But perhaps Albania’s most exciting quality: it is still off most travelers’ radars. For tourists lucky enough to make the quick hop from Italy or Croatia to explore this ancient culture mixed with modern nightlife, gastronomy and conveniences, the beauty and traditions of a country not yet plagued with overcrowded beaches, hiking trails and natural landmarks are ready to be discovered. Whether your ideal trip includes the coast, the mountains, history or food, these five Albanian highlights have something for everyone. Saranda, at the southern end of the country and just across the channel from the Greek island of Corfu, is one of Albania’s best coastal cities. The beaches are all postcard worthy, the water is crystal clear, and the food is so fresh you’ll often see the boat deliver the ingredients you eat each night. Saranda is surrounded by many remote seaside secrets, but when you’ve had your fill of the Adriatic take a short bus ride to the Blue Eye, a freshwater spring in a deep karst pool that feeds the Bistrice River. After a day of sun, there are plenty of clubs and bars to explore, but one of the favorite local activities is going xhiro, or promenading along the beach in the evening with family and friends. 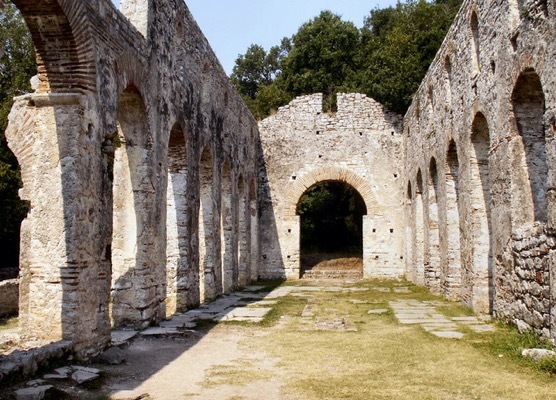 Rich in biodiversity and history, the UNESCO-protected site of Butrint is an ancient city once controlled by the Greeks, Romans, Byzantines and Venetians. Hike to the castle (entrance: $4), where the Albanian flag is perched, and look over the park’s 36 square miles. Enjoy the lagoon, explore the amphitheater, or just relax in nature. To make the most of your experience, book a day trip with Our Own Expeditions, an outfitter specializing in Albanian history and culture. Tushemisht, which sits on the shores of Lake Ohrid and next to the Macedonian border, is the location of one of Albania’s most iconic films: Zonja nga Qyteti or The Madam from the City in which a woman is forced to leave the city for the village. In the end, of course, she falls in love with the community’s charm and kindness. The village has same effect on foreign visitors and you’ll instantly feel it with the small shops selling traditional clothes and other items. Tushemisht is also famous for its mountain-water fountains, nearby beach and extraordinary food grown within steps of the restaurants that serve specialties like a lake trout called koran. It is rumored that even the Queen of England has tasted it. After dining, take a walk to Volo Reka, also called Drilon. This protected forest and lagoon area is a great spot to explore and take Venetian-esque boat rides (about $2 an hour). Albania’s capital is also the country’s most cosmopolitan city. A visit to the National Museum as well as the National Gallery of Art will help to shed light on the country’s complicated history, which includes the interweaving of Illyrian, Ottoman and communist culture. Both of these are located in Tirana’s center: Skenderbeg Square, which is named after the most famous Albanian hero. Tirana’s restaurants serve both local and international cuisine, all with fresh ingredients from the surrounding villages. A local favorite is Zgara Korcare, which serves traditional Albanian grilled meats and vegetables. For nightlife, head to theBlloku area, which has become the go-to spot for coffee, a cocktail or late-night dancing. The Valley of Valbona sits in the Albanian Alps in the northern quarter of the country and is the perfect adventure for hikers. A newly established ferry ride on the nearby Komani Lake allows tourists to experience the steep mountains and magnificent views firsthand. The Northern Albanian Highlanders are known throughout the region for their hospitality. Locals are more than willing to help with any navigation needs, so don’t stress out if you speak little to no Albanian.